I think this little gal is adorable. This card is super simple. Once the image was colored wth Copic markers and cut out using a Large Circle die, I just layered some coordinating papers to make the card base. 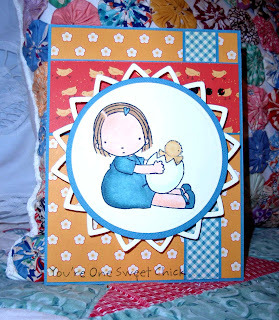 Then I matted the image with a second Large Circle die in a pretty blue. My final step was to use this die. It is called the Lotus Pendant Die- but I am not sure why. I think it makes a fun effect on this card. I am keeping it short and sweet today. Just wanted to drop by on this holiday weekend Saturday and say a quick hello.